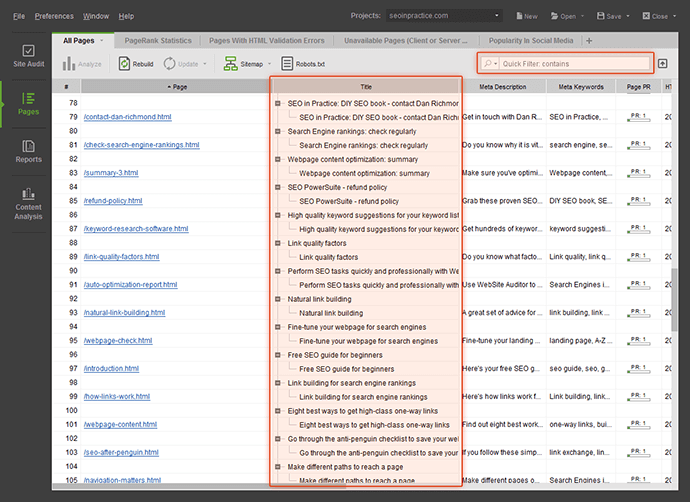 Browse through the screenshots demonstrating the most important SEO PowerSuite features and find out how these tools assist a webmaster or optimizer in each and every SEO task. Choose the module you're interested in and click to start viewing. 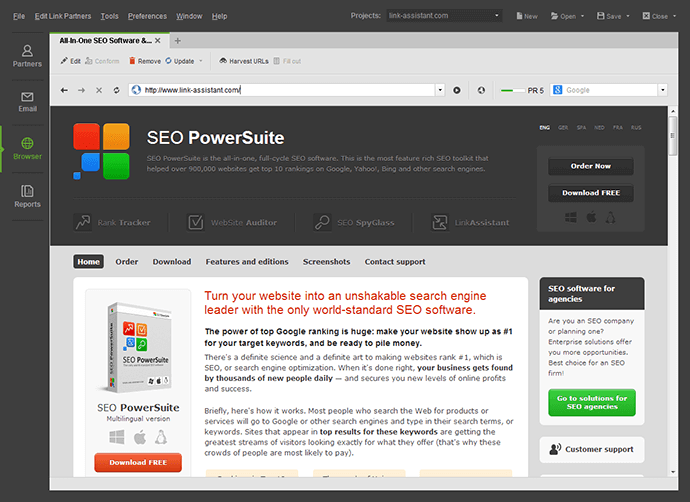 However, to cut short the way to effective promotion of your website, all you need is to get SEO PowerSuite on your computer. 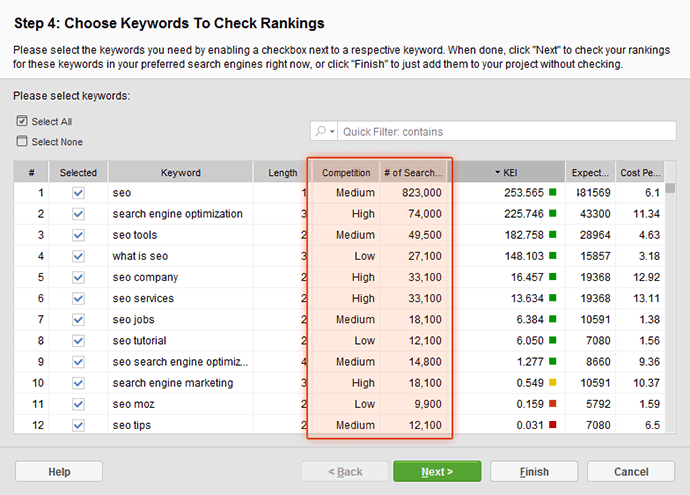 Rank Tracker lets you use the powerful "Suggest Keywords" feature. With it, you'll be able to grab huge lists of traffic-generating keywords using Wordtracker, Google Suggest, your competitor's websites, and many other methods. 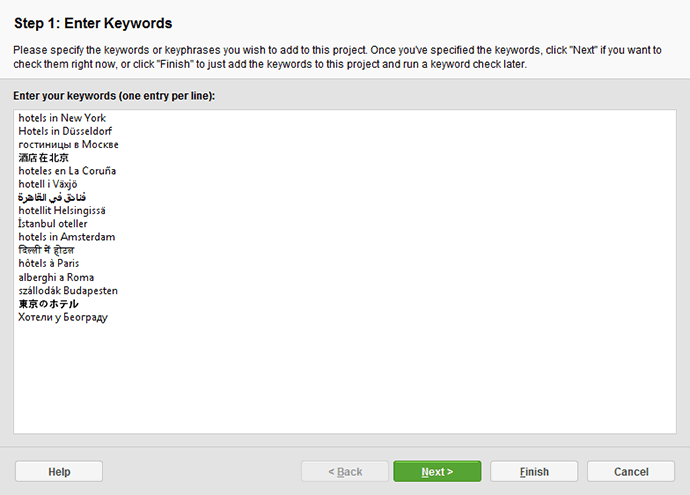 Discover profitable keywords you've been missing out on! 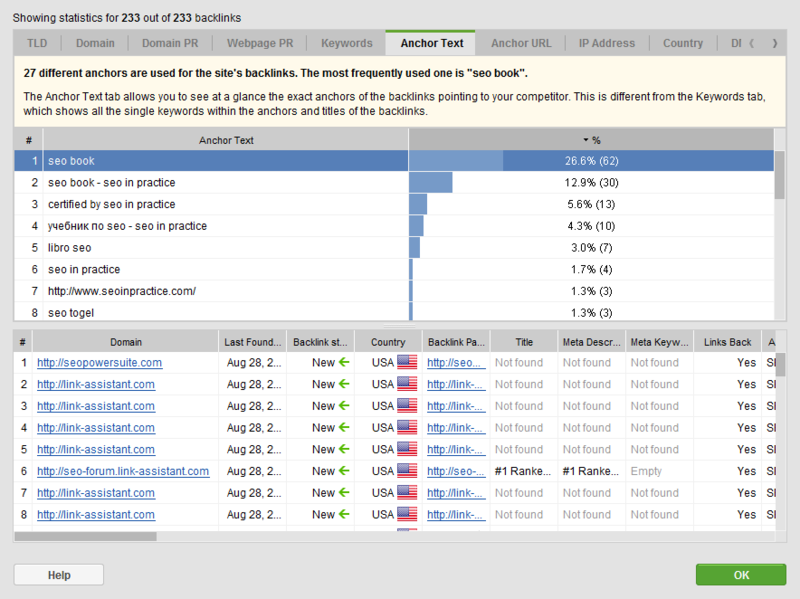 It takes a few seconds for Rank Tracker to find out the number of times a keyword is being searched by real people, plus how stiff online competition for this keyword is. 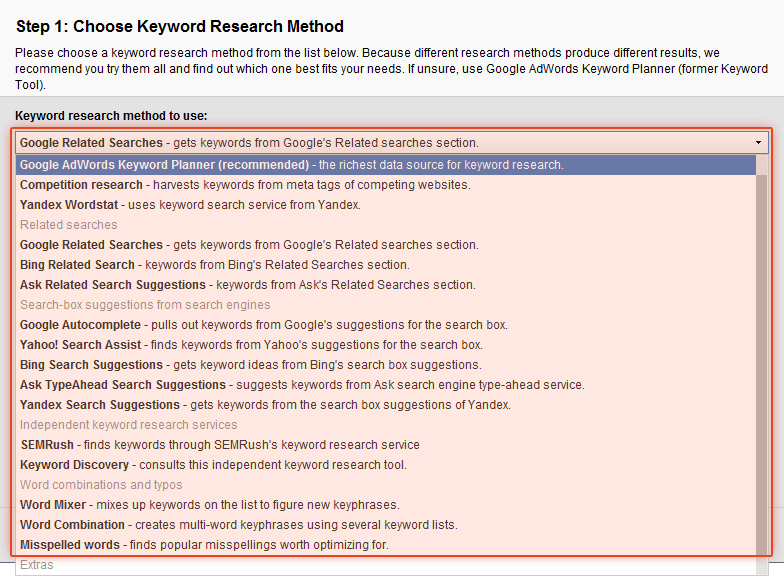 This helps estimate how hard it would be to optimize for any of the words found. For each keyword, Rank Tracker will calculate Keyword Efficiency Index, or KEI which demonstrates how profitable a word can be. Keywords with the higher KEI have the greatest potential to bring targeted traffic to your website. All keywords will have green to red markers depending on their KEI, so that you easily find the best words to optimize for. 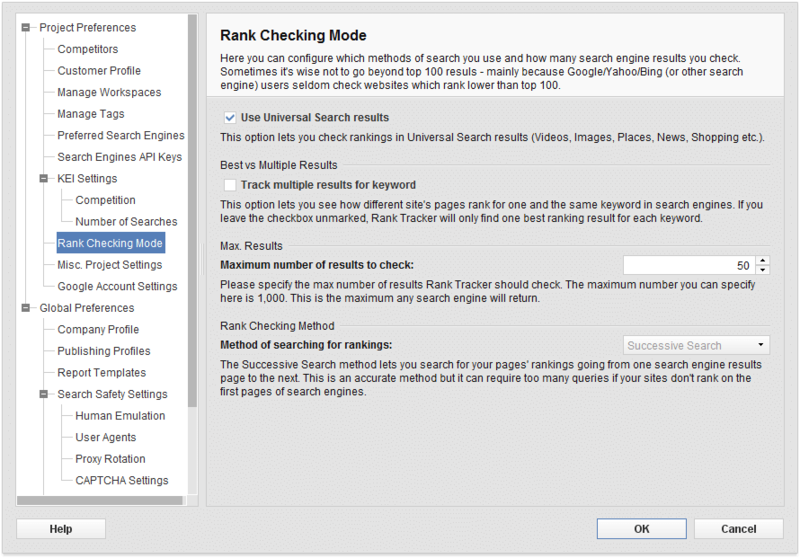 Rank Tracker will quickly find out where your keywords are ranking in any of the supported search engines (today you've got a huge list of over 400 search engines to choose from). If you need more search engines, you can send us a request and we'll fulfill it within just a few days! 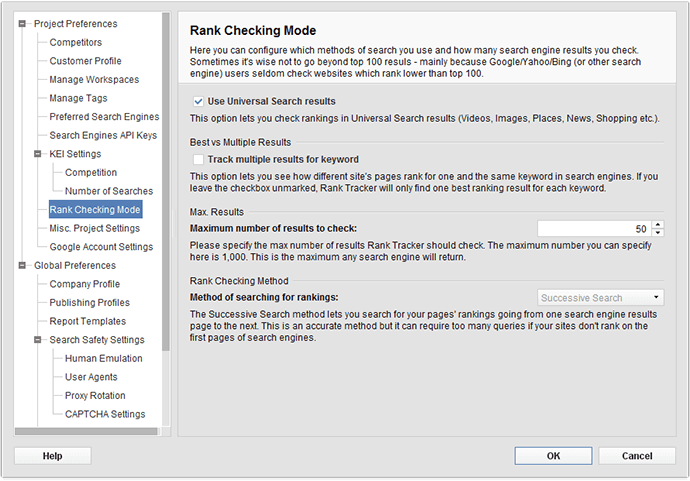 Run huge volumes of rankings checks for an unlimited number of keywords without violating search engines' policies. Rank Tracker supports standard API keys of Google, Yahoo! 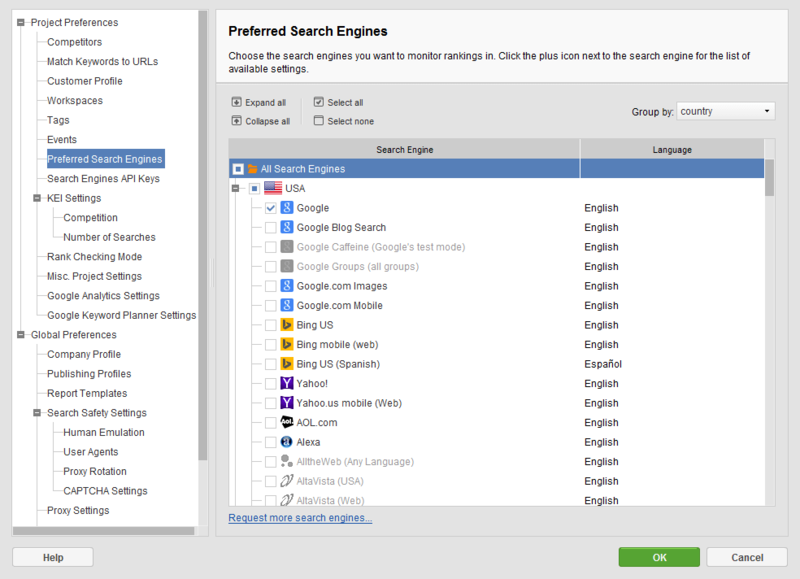 and Bing as well as advanced human emulation features. Take any search terms, from keywords in English and words with non-latin symbols like German umlauts or French accents to words in Cyrillic, Oriental languages or languages with right-to-left writing — and Rank Tracker will process them with no problem at all! 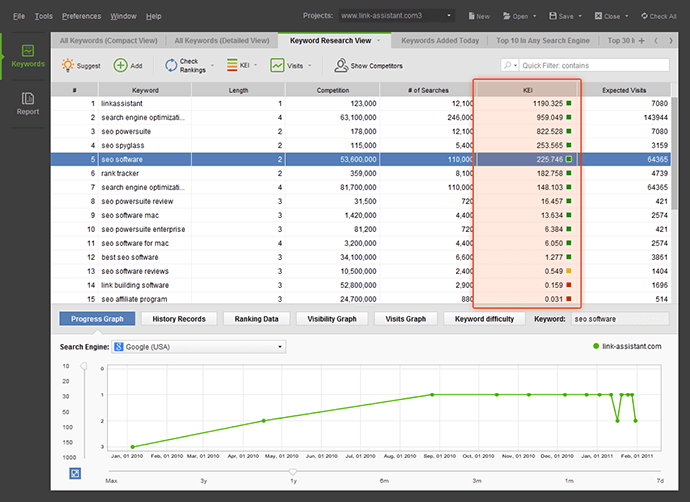 Rank Tracker keeps a daily, weekly and monthly change record to notify you where your site ranks for any search term, at any time! Rank Tracker also draws eye-candy progress graphs to demonstrate your progress visually. Images often speak louder than words, so the visual charts will be a great help to get a quick idea of your rankings development. With Rank Tracker, you can save time and traffic. You'll be able to choose to search any number of result pages to check for your site, be that Top 10, Top 100, or Top 1,000. 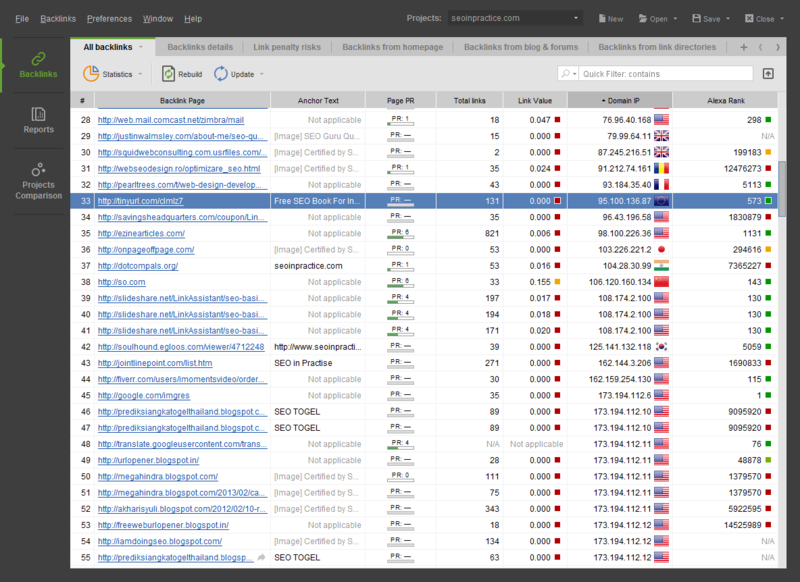 If you expect your site to show up somewhere in Top 100, just set search limit to 100 to save your time and bandwidth! It takes a mouseclick to generate industry-standard rankings report with all data on keywords and their rankings clearly demonstrated in nice tables and charts. 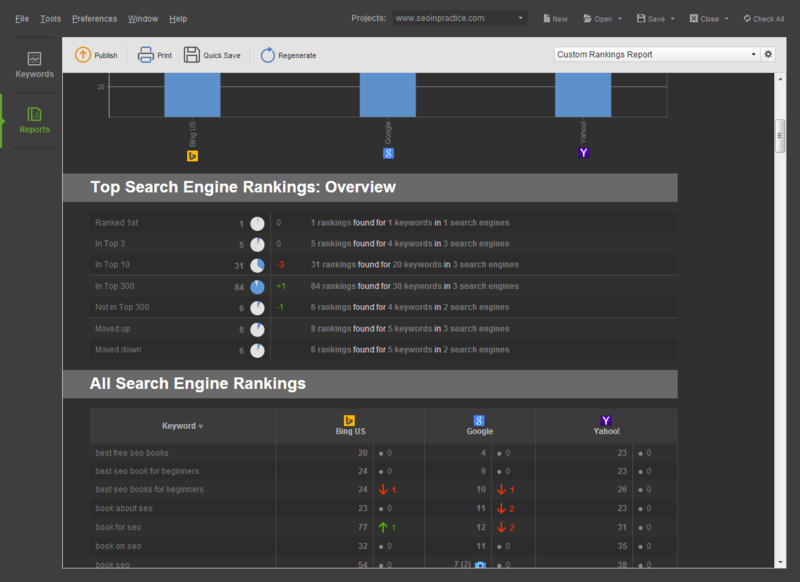 Rank Tracker reports are completely customizable. 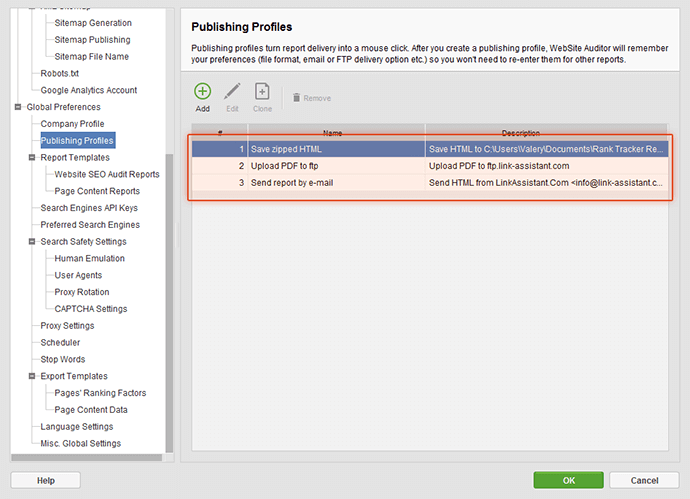 Choose the layout and report sections to include, add your and/or your client's company logo and make the report match your brand colors — pretty much everything can be customized. It's easy to make rankings data available outside the software. You can make the standard HTML or PDF exports of your reports — ideal for printout. 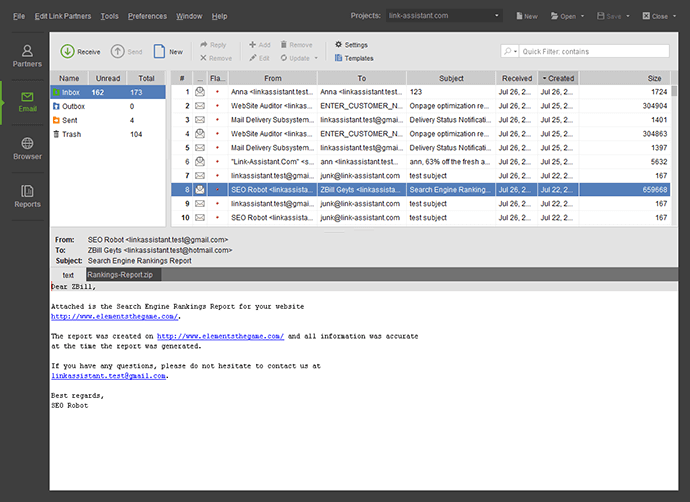 Or quickly deliver reports to your colleagues or clients: you've go instant emailing and FTP upload features at your fingertips. 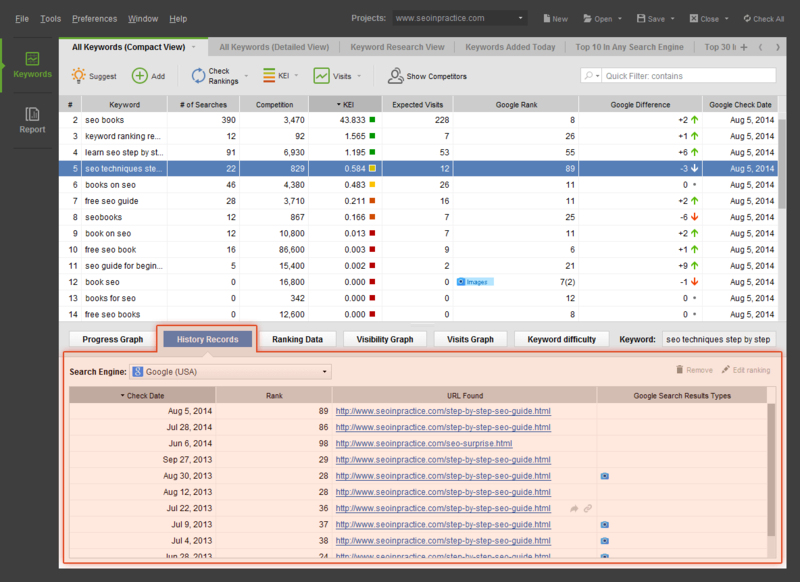 WebSite Auditor collects all pages of your website, seen or unseen to search engines, and gives you the whole picture of your website's structure. 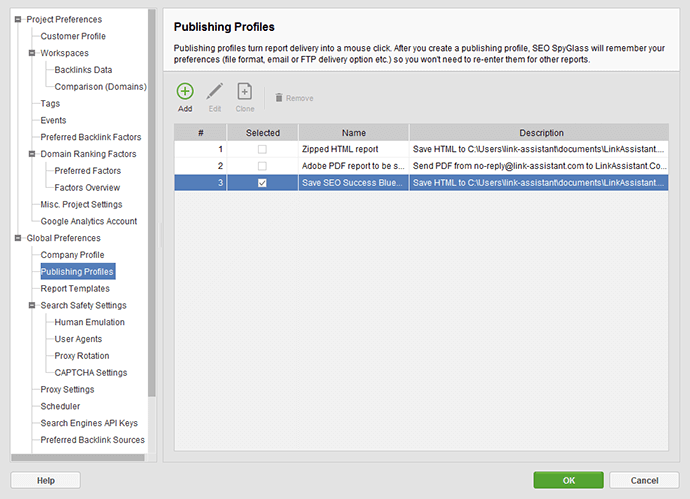 The pages are neatly arranged into a tree-like list so that you can conveniently analyze your website's architecture or each of the pages separately. You are let loose to core-deeply analyze your website's link structure, HTML coding, popularity characteristics and other important aspects that may influence search engine rankings and indexing rates. Check dozens of vital factors for each and every page of your website in a single mouse click or request some more factors you need. 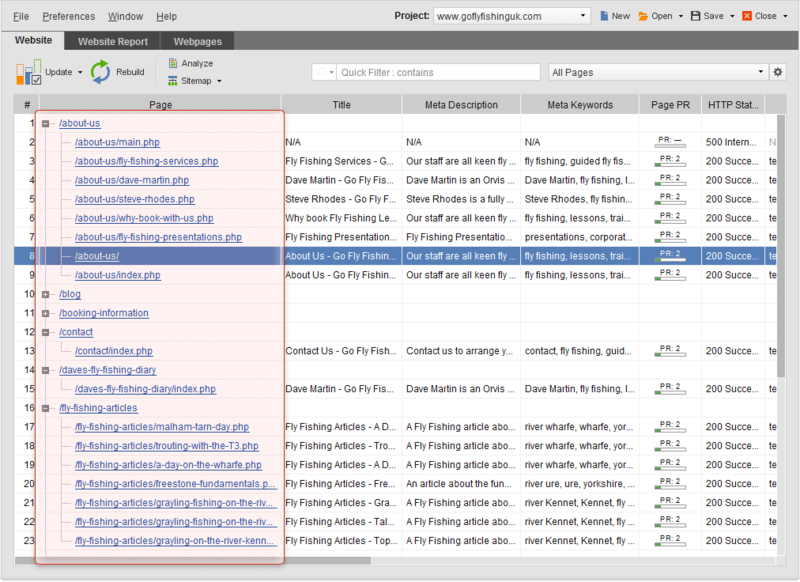 At any moment whenever you need it, you can fine-tune the information layout in your workspace in WebSite Auditor: add or hide columns with analytical data, filter or sort the records by any characteristic, use quick filter for instant search or even group your pages in a tree-like catalogue by a chosen factor. 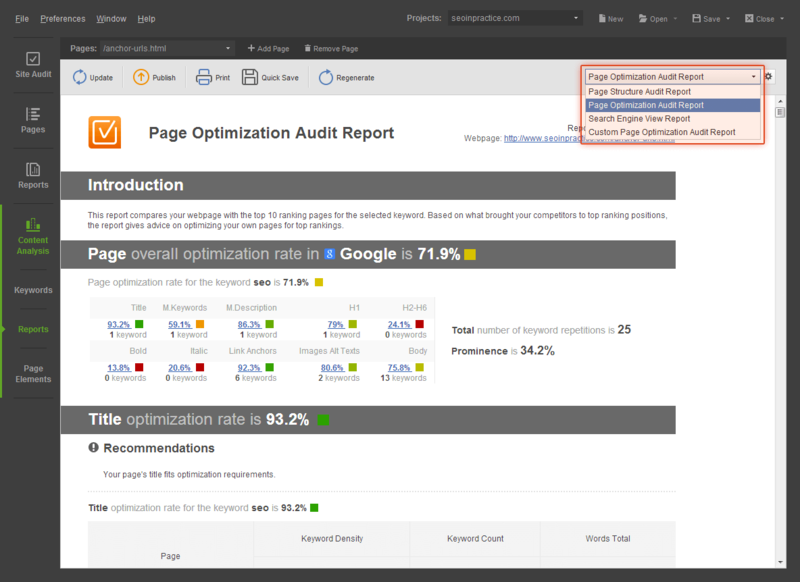 WebSite Auditor lets you analyze and optimize the content of each individual page. 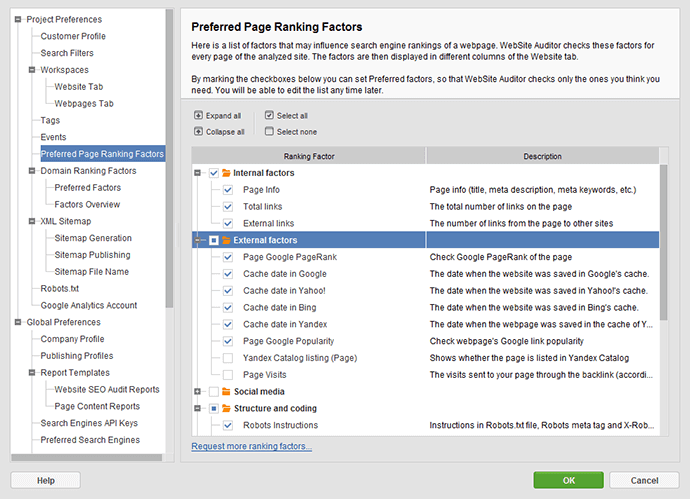 It shows you how well your page is optimized right now, estimates your current chances to catch up with the top ranking guys and demonstrates how your top 10 search engine competitors got their positions. 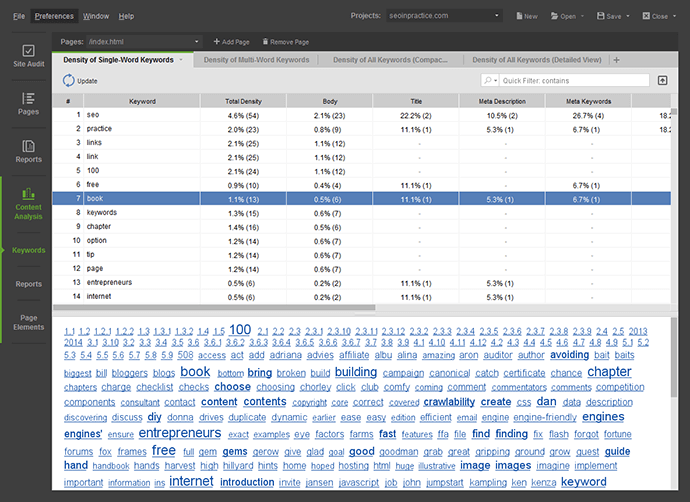 Get details on keyword density for the whole webpage and for each separate element of a webpage's code and export data in .txt, .xml, .html or .sql formats if you like. 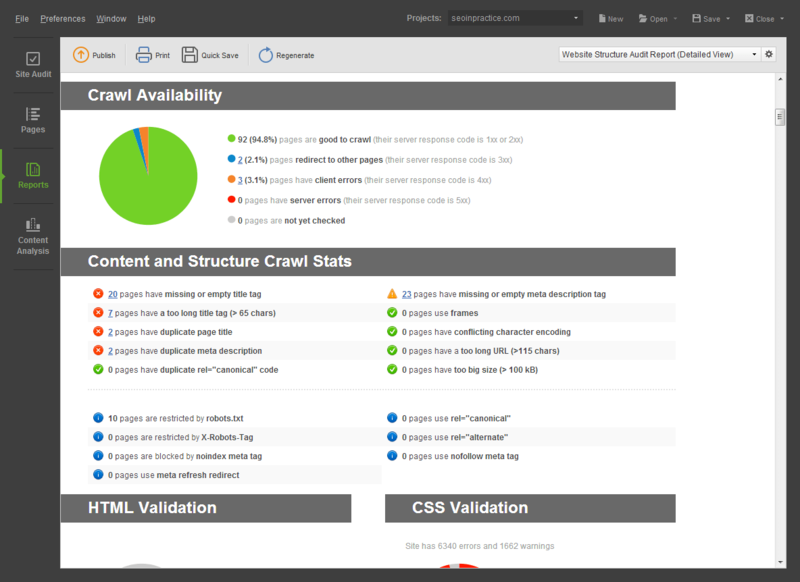 WebSite Auditor will work for highly targeted optimization of your page content in 655 search engines. 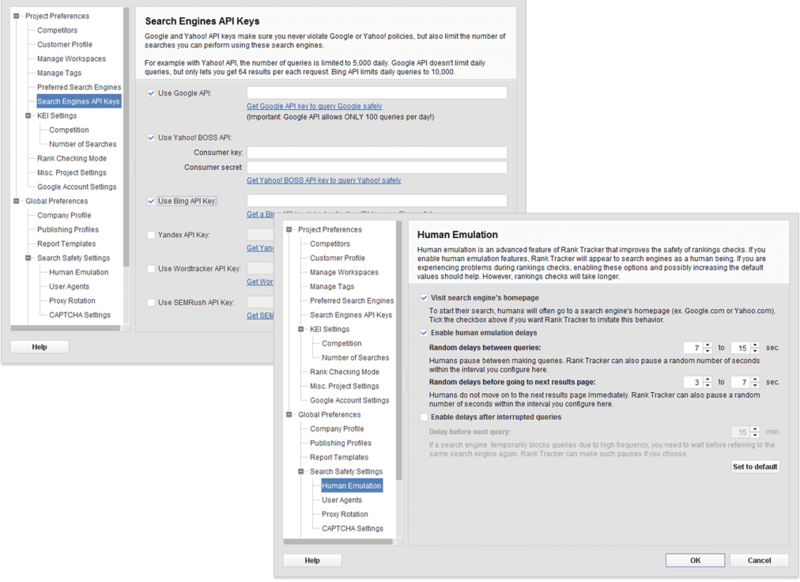 The software digs up loads of info on your website and on your competitors for the selected keyword in the selected search engine. 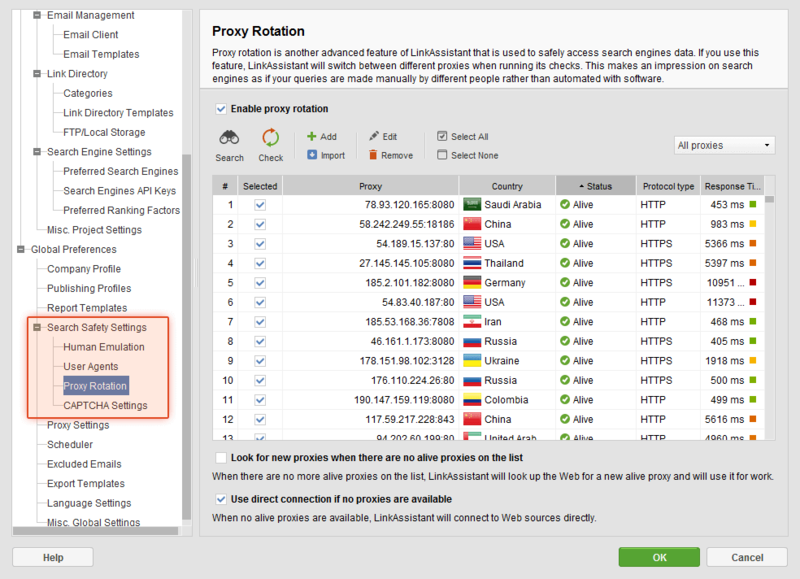 It lets you identify smartest optimization techniques working best for your particular niche in the particular search engine you target. 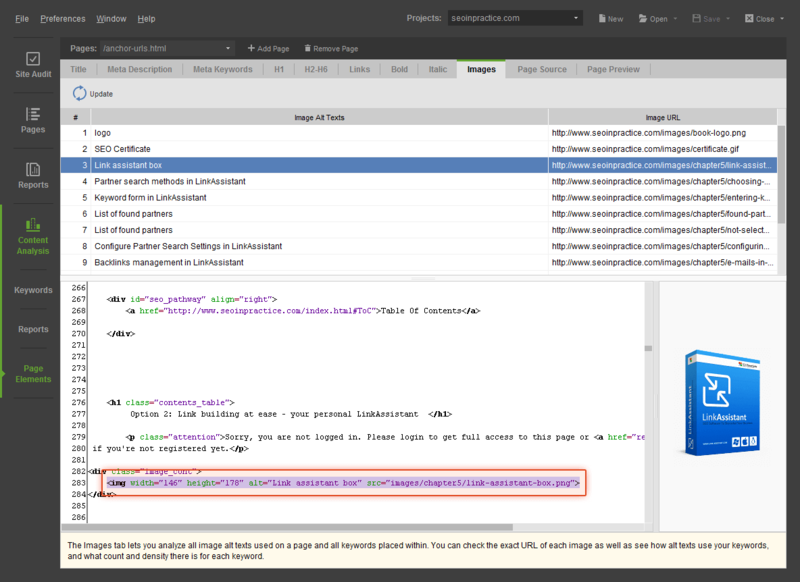 In the Website tab in WebSite Auditor you can generate clear and logically built reports on all structural aspects of your website, its link structure and HTML-coding. This report also includes your domain's general statistics and popularity in social media. In the Webpages tab you can generate various types of reports dealing with content optimization of each particular page: keyword use, top 10 ranking competitors' analysis, load speed. You can even look upon your page through search engines eyes in the special Search Engine View report. 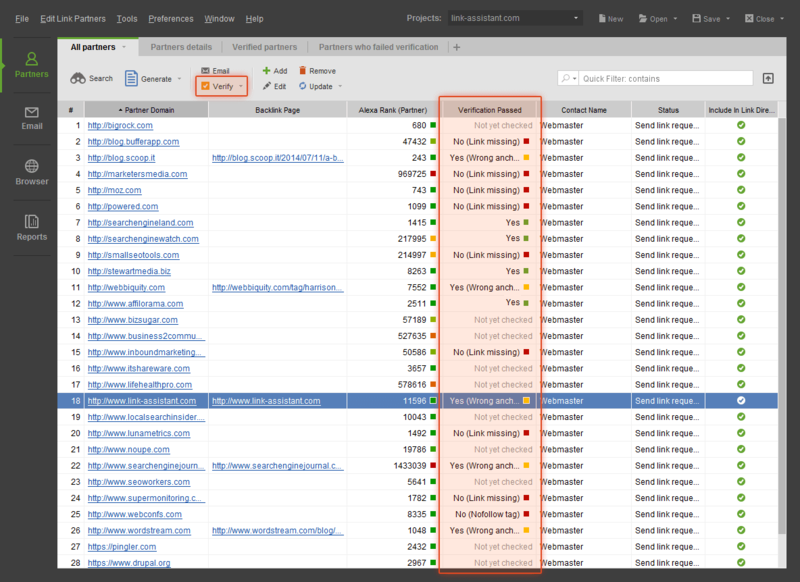 Website Auditor alarms you about problem elements on your website and will show you key areas where you should put the most valuable information to get visitor's attention. All these will be clearly indicated in your page's code. 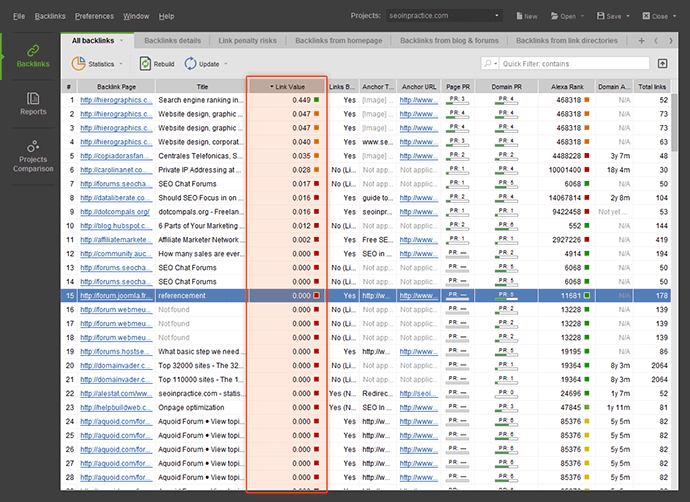 The unique profit-boosting feature of WebSite Auditor is its reports for inexperienced SEOs. They were specially designed to make content optimization easy and understandable even for SEO newbies starting from scratch. All optimization notions and tricks are explained in great detail, as if you had a personal SEO consultation. 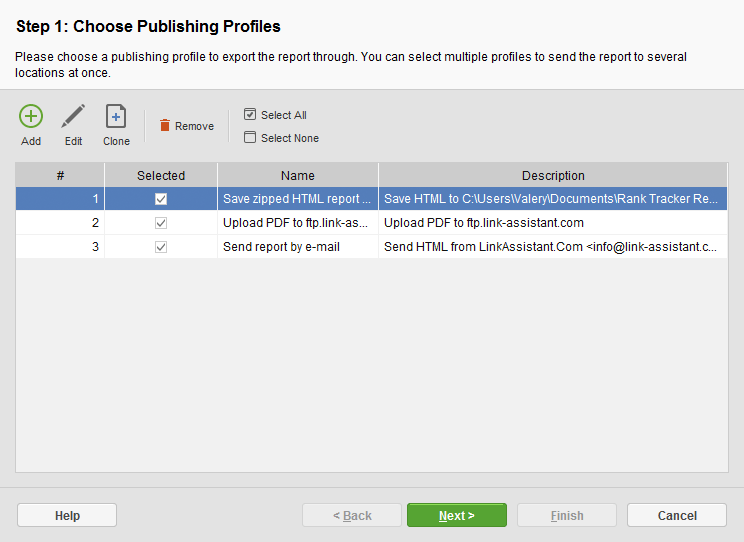 Like any other software in SEO PowerSuite, WebSite Auditor allows report exports in PDF for printout, as well as HTML. 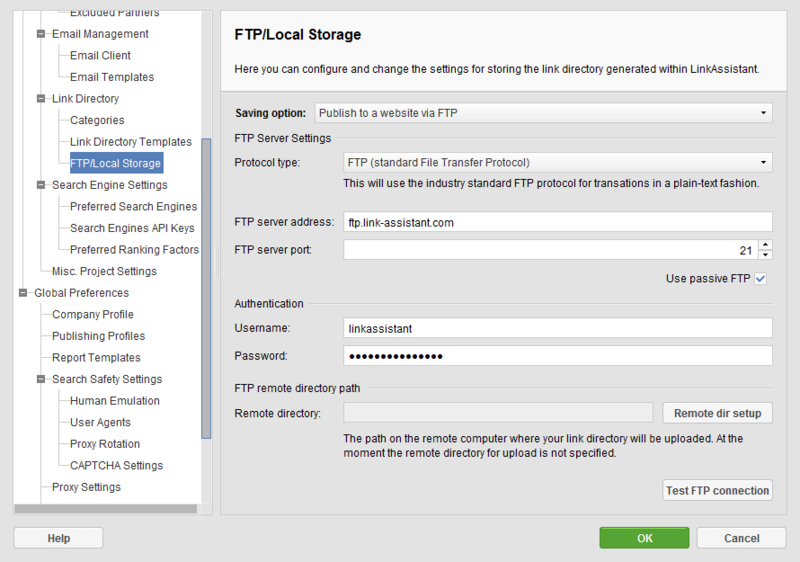 You'll easily do FTP uploading of the reports or email them right from the software. Each on-page optimization report is customizable to include only the sections you choose. 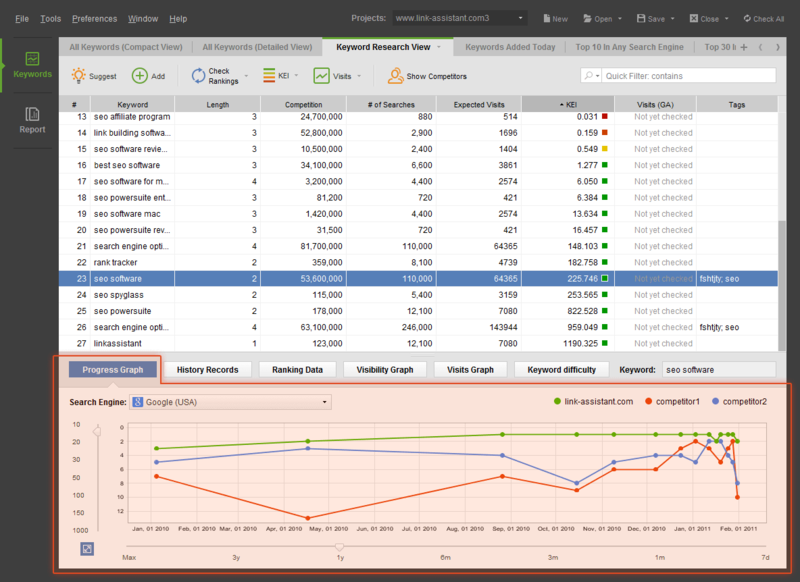 You can custom-brand reports with your (and/or your client's) company logo, make it match your brand colors and tune everything to your taste. Get loads of info on your leading competitors in all supported search engines. 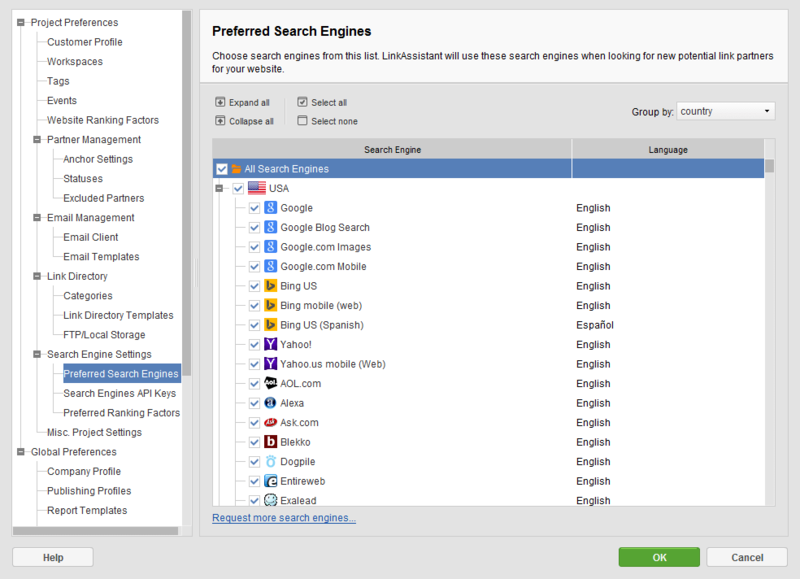 You just enter your main keyword and choose the search engines that are important to you and SEO SpyGlass digs for all data on your competitors' winning link building strategy. It will take 5 to 10 seconds for SEO SpyGlass to check what backlinks pointing to your competitor's website a search engine sees. In mere seconds the software comes up with a massive list of webpages that have a link pointing to your competitor. 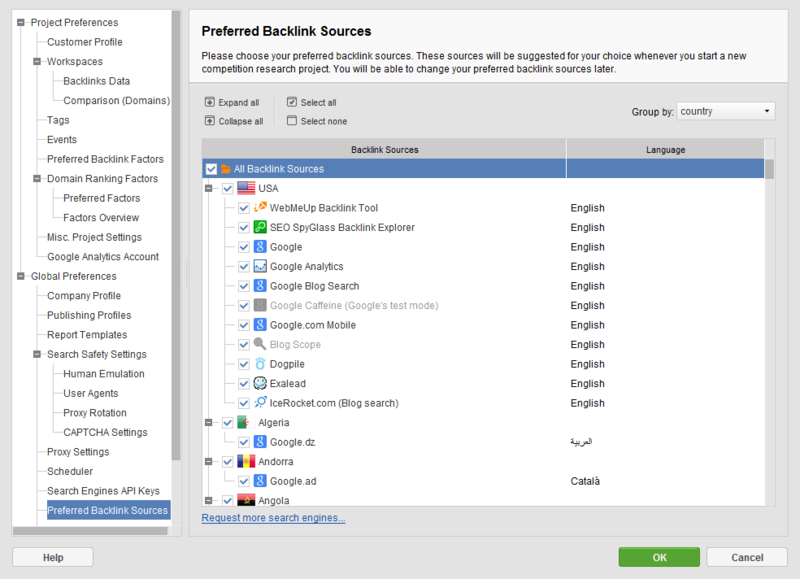 You will get specific info on each one of the #1 ranking guy's backlinks. 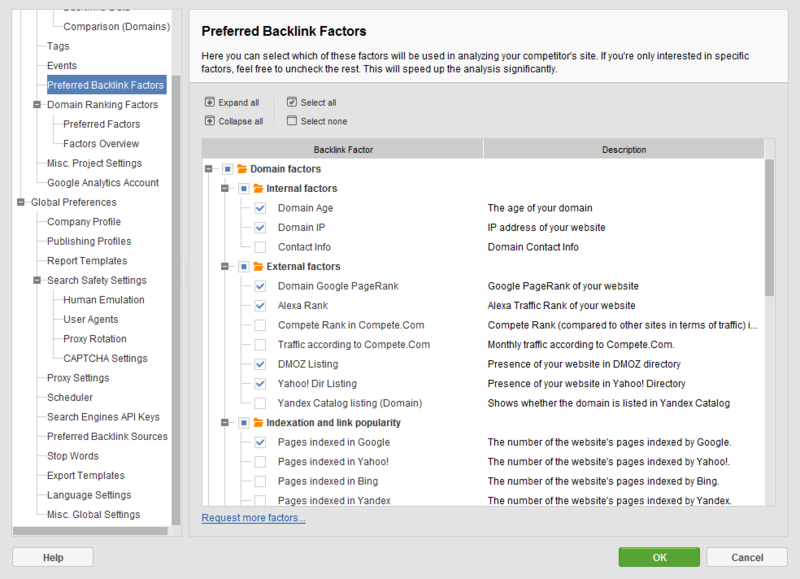 SEO SpyGlass provides a detailed study of all backlinks, checking it for factors that influence a webpage's rankings in search engines. 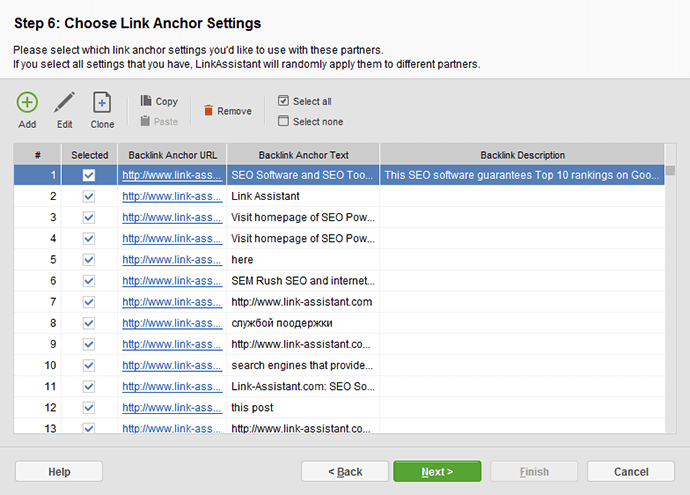 SEO SpyGlass will analyze keyword use in links anchor texts and in the titles of linking pages. 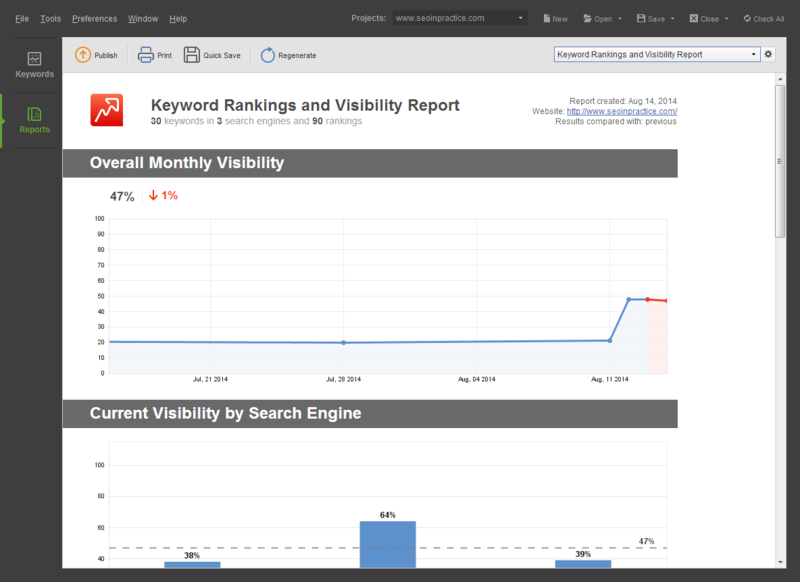 This helps you find which keywords your competitors are using to promote their websites and determine relevance of each potential link. 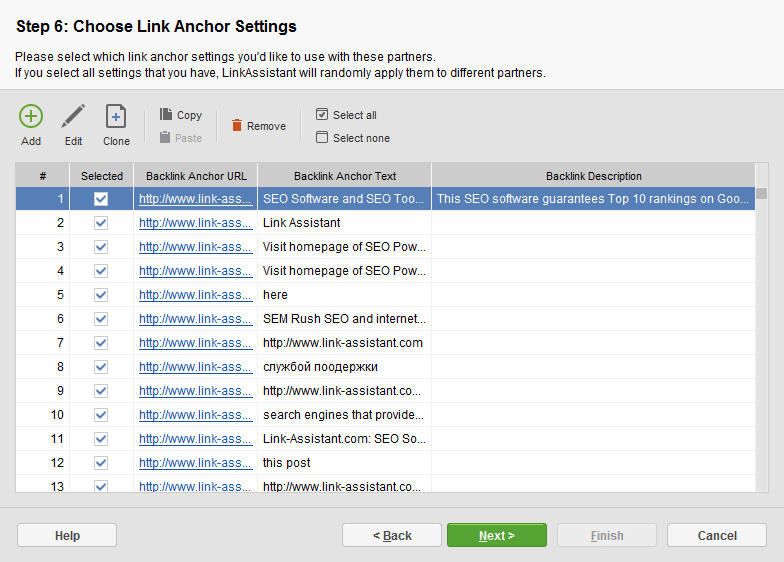 SEO SpyGlass will calculate Link Value of each partner's backlink. This helps you estimate how profitable each potential link can be for your website. After twisting and turning all link data, SEO SpyGlass comes up with a winning link strategy for your own website to outrank the #1 competitor. 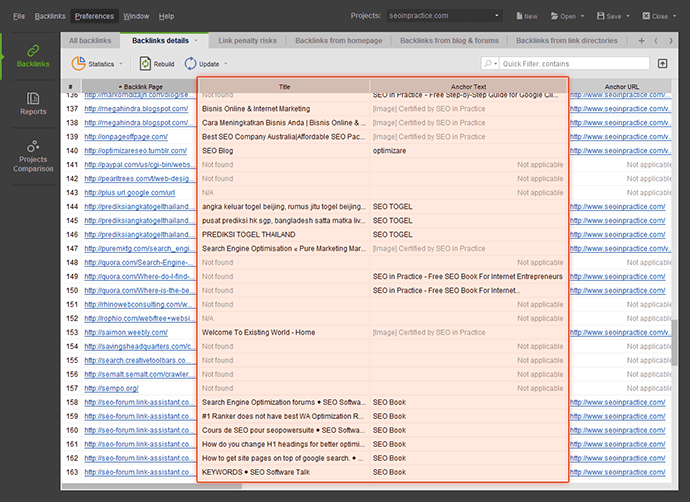 Discover the best sources for incoming links to your website. 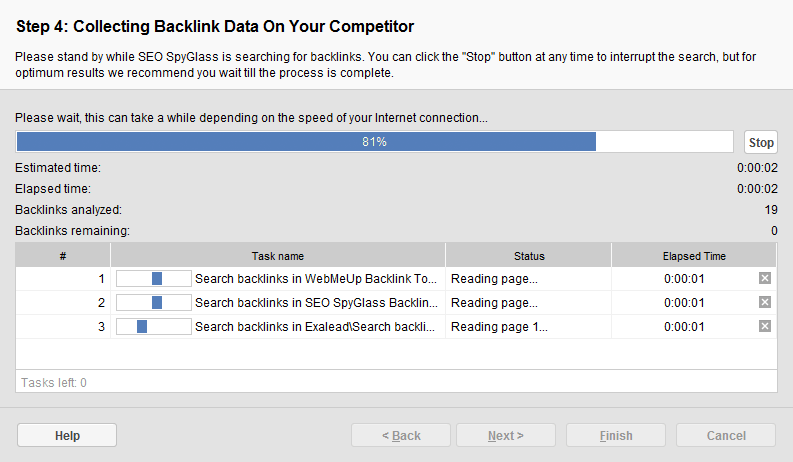 For advanced folks, SEO SpyGlass provides an even deeper analysis of all competitors' backlinks. 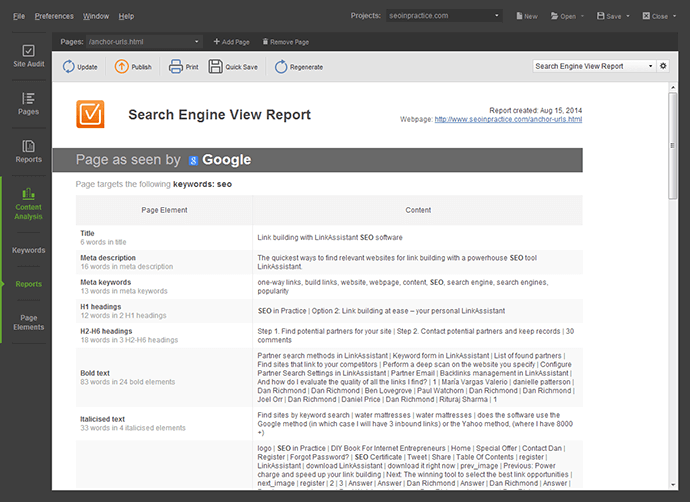 Hit the 'Analyze' button of the main tab — and get more info on keywords in your competitor's anchor texts, PageRank, Alexa rank, directory listings, top-level domain links, IP addresses and country, ages of linking websites and other factors important for a website's search engine rankings. 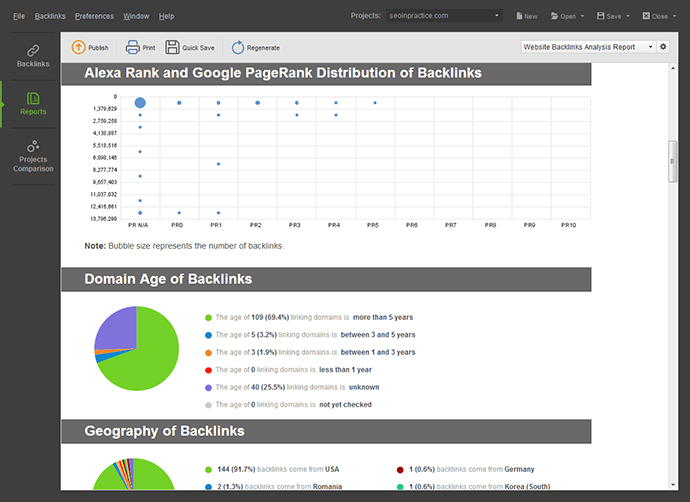 You will get a detailed report on your competitor's linking strategy showing how exactly your competition became a search engine leader. 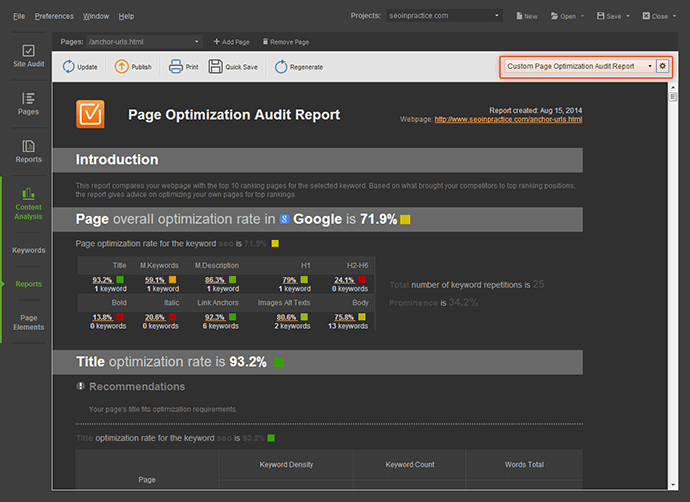 The report will be a strong base for successful optimization of your own website. 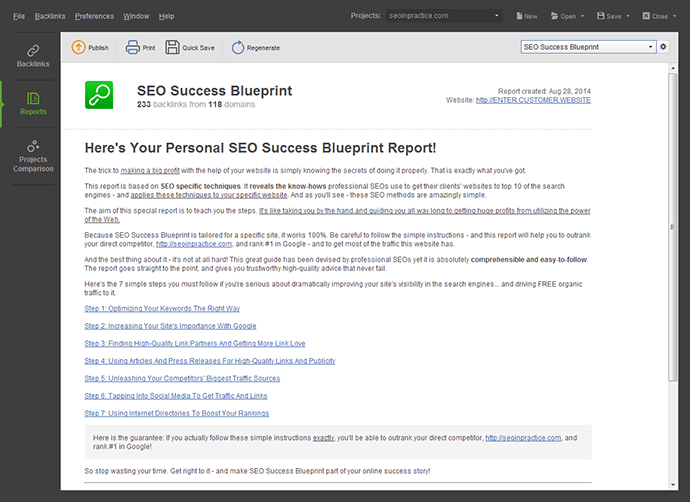 SEO Success Blueprint works like your personal step-by-step link building guide to outrank your online competition and get top 10 rankings in search engines. 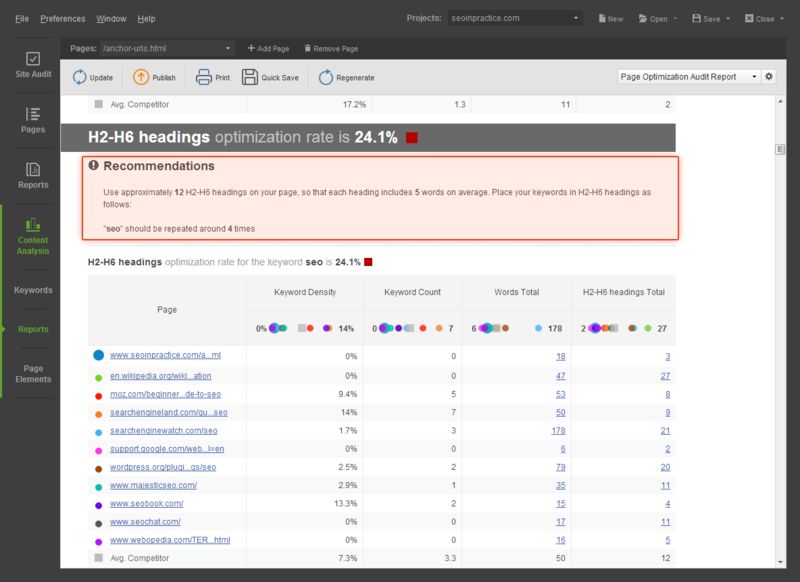 The report will explain in great detail each optimization step that needs to be done, putting all advice in plain English, easy even for a complete newbie. 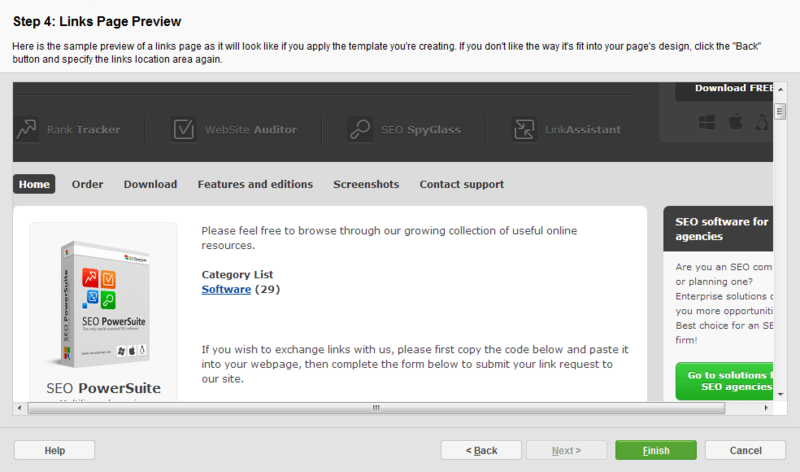 SEO SpyGlass lets you choose any of the 3 types of reports to generate: SEO Success Blueprint, Website Backlinks Report and Website Backlinks Analysis Report. You can easily save your reports in HTML format or in the industry-standard PDF for printout, email reports to clients or upload them via FTP straight from the software to make them instantly available online. 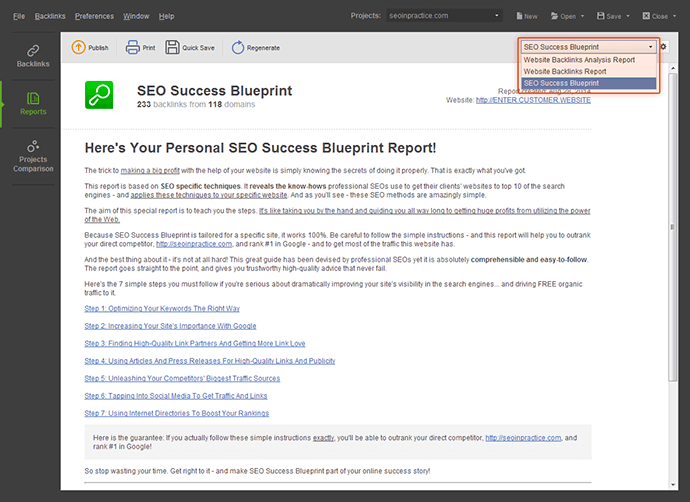 you've got one software to promote all customers' sites. Start new projects for each website you're working at and run as many projects as necessary to push up websites in 566 supported search engines. saves you time when you're pushing up a multi-page website all at once and makes sure you aren't troubling site owners with repeated link requests. 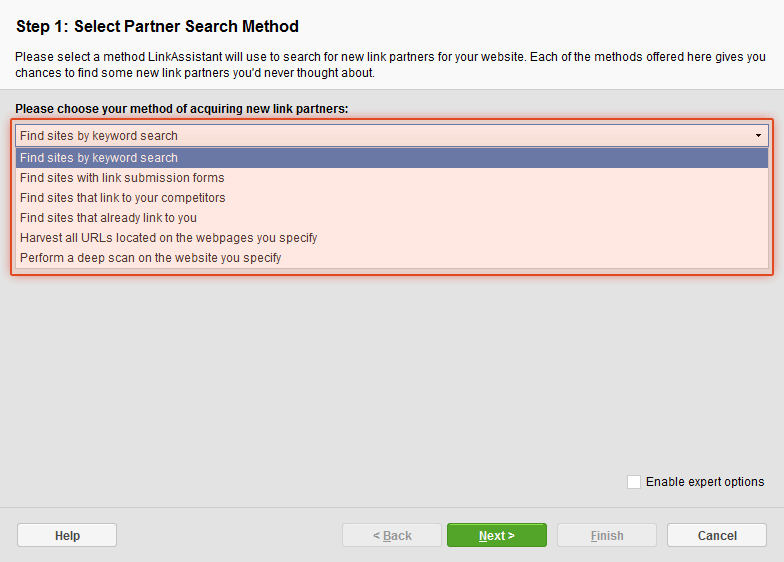 to quickly find only relevant (and profit-boosting) link partners who are most likely to link back. saves you weeks of routine work at the beginning of a link building campaign — you'll quickly exchange links with high-quality relevant websites. you'll use customizable mail templates to send link exchange requests and be personal and convincing with thousands of potential link partners. 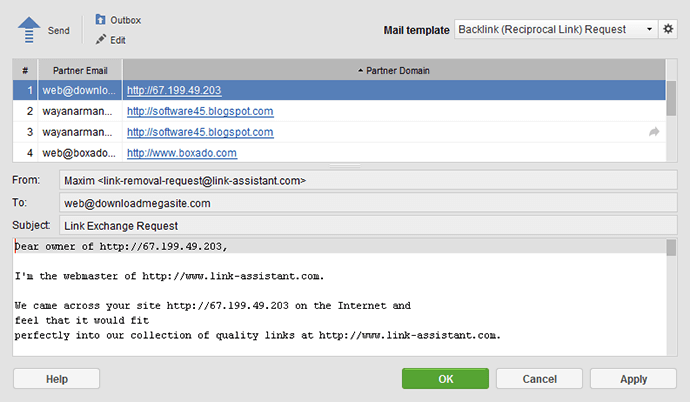 send and receive link exchange requests and conveniently keep all partner correspondence inside the software. 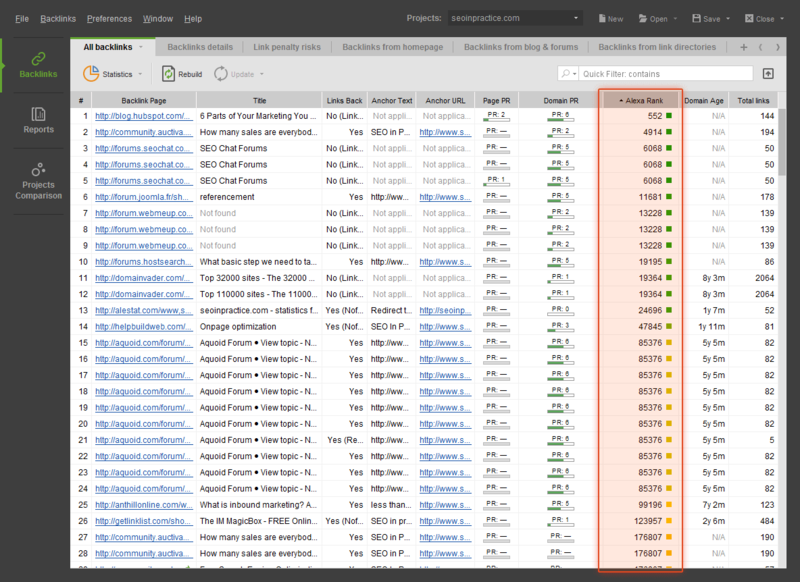 maximize Google-friendliness of your links to speed up the website's ranking growth — without any extra effort on your part. 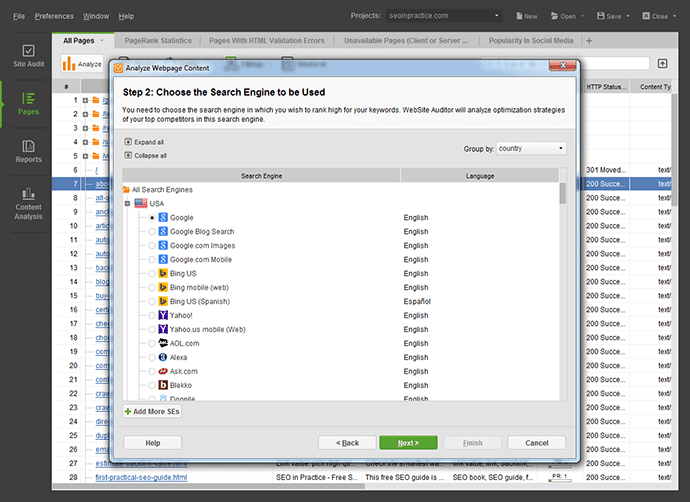 impress your clients with easily navigable link directories that are well-organized for people and search engines. 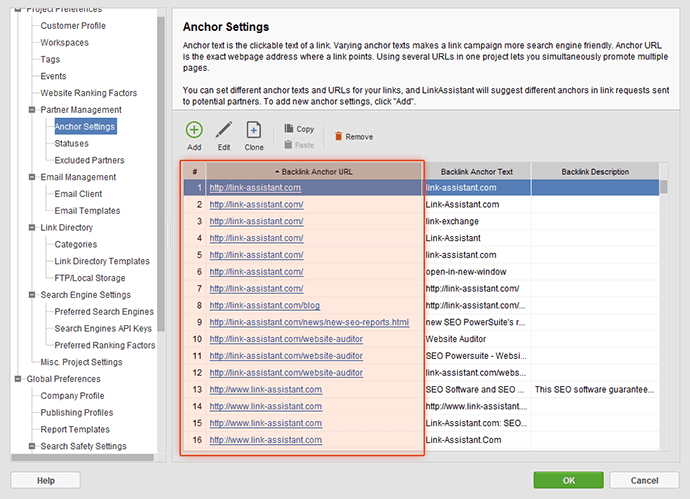 you'll make professional-looking link directories in the same design as the whole website within a few seconds, leaving no traces of SEO software activities. you can upload directories to clients' websites right from your link building software — no need for an extra FTP program. And it takes a second to re-upload after any minor change you make! you've got extra security to perform multiple link building tasks risk-free. 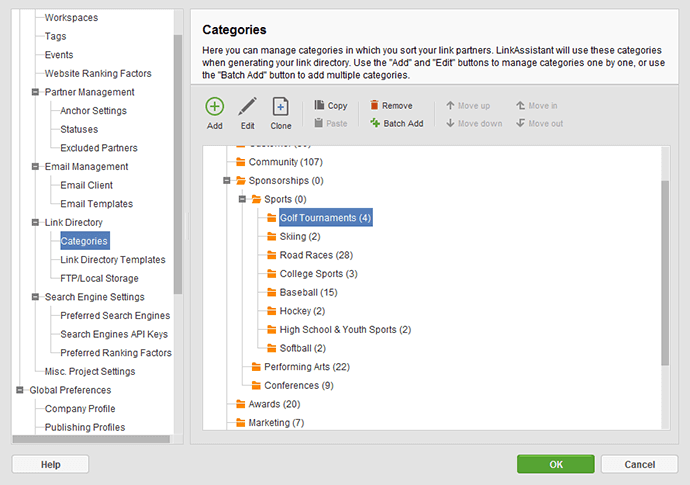 LinkAssistant is the most search-engine-friendly link tool. 32. Every 3rd SEO business relies on SEO PowerSuite.